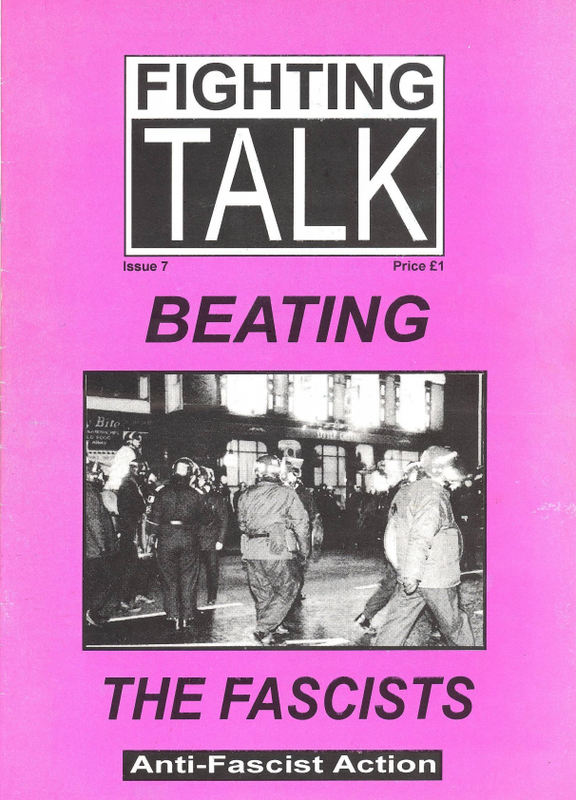 Issue 7 of Anti-Fascist Action's Fighting Talk magazine. From issue 7 of Anti-Fascist Action's Fighting Talk magazine, 1994. The question of whether anti-fascists should call on the state to ban fascist organisations or demonstrations has always been a controversial one. The moderate wing of the anti-fascist movement has never had any problem in appealing to the state. For all their apparent differences on other issues, Searchlight, the Anti-Racist Alliance and the Anti-Nazi League have all made such demands on the police at one time or another. Anti-Fascist Action represents a different tradition - militant anti-fascism. In contrast to the other groups mentioned, we have never called on the police to do our job for us. Nor will we. In this article, Jim Kane explains why. 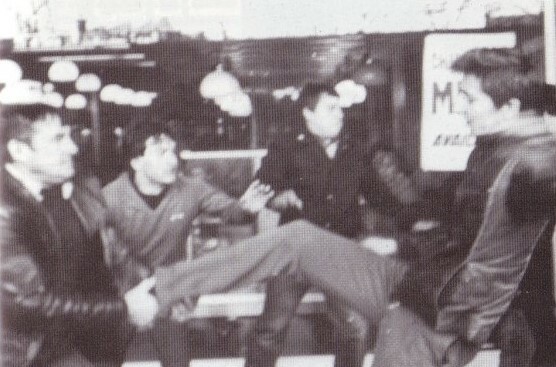 Militant anti-fascism has a single goal - to forcefully disrupt the fascists from going about their business. Our aim is to prevent them from selling their papers, distributing their leaflets, putting up their stickers and posters. Our intention is to make it impossible for them to stand candidates in elections, and where they do manage to stand, to disrupt their campaigns at every stage. Ultimately, our aim is to crush them completely, to wipe them off the face of the earth. These are serious matters: the fascists know the importance of physical force in politics, and are far better organised on this level than the so-called revolutionary left, which is long on words, short on action. If you set yourselves these aims, as we do, you have to work out a serious strategy of how to carry them out. You have to know what it is you are up against, and what it is you are doing. We have never made any bones about it: to fight the fascists ideologically, you have to fight them physically. To fight them physically, to disrupt their meetings, to subject them to the pressure that they try to subject us to - to do any or all of these things means to break the law. A purely "legal" anti-fascism is no anti-fascism at all. You don't have to be Einstein to work out the consequences: if you set out on a militant strategy, you are on a collision course with the forces of law and order, the state. If you seriously oppose the fascists in a way which is effective, you are operating against the state. This is a fact of life. The fascists often taunt AFA as "bootboys for the establishment", claiming we do the mainstream parties' dirty work for them when we attack the "real" revolutionaries of the far right. It's not our job to point out to the fascists that they are making a mistake on this - let them dream on. But if we were to entertain the same illusion, that we are in some way involved in a common fight alongside the respectable politicians of the establishment parties, then we will come a cropper. The moderate wing of the anti-fascist movement does see things in this way. Searchlight makes no secret of the fact that they trade information with the state, and that they want to see the state take a more active part in combating fascism. The Anti-Racist Alliance and Anti-Nazi League similarly expect, though they are sometimes disappointed, that the police will take their "responsibility" for keeping the peace seriously enough to keep the fascists and anti-fascists apart. This is what happened at Brick Lane after the fighting the first week after the British National Party election victory. The anti-fascists turn up to demonstrate peacefully, while the police stop the fascists from getting anywhere near them. And it worked, in a fashion. The fascists lost their paper sale, or rather gave it up sooner than get involved in a regular set-piece with the Old Bill; the anti-fascists got to take over the corner of Bethnal Green Road and Brick Lane and proclaim the area a "Nazi-Fee Zone." Everyone, the BNP excepted, is happy. Or so it seems. True, the fascists temporarily lost their paper sale, and that is no bad thing. But the anti-fascists lost something else that is far more important in the long run: they lost their momentum. As we warned in the previous issue of Fighting Talk, two or three weeks of turning up in droves to shout anti-fascist slogans when you know the fascists won't be allowed to turn up is more than enough for most people. Numbers fell very rapidly at Brick Lane thereafter - the Militant decided to call the whole thing off, just weeks after they pledged to drive the fascists out of Brick Lane “forever", while the Socialist Workers Party opted for a handful of paper sellers on the corner instead of a full ANL turnout. The police were more than happy to keep the fascists at bay so long as it was a matter of hundreds of anti-fascists turning up - they didn't want any more bad publicity, after all. But when the numbers fell down to the tens, the police, too, called it a day, and left everyone to get on with it. Overtime or no, it’s cold out there protecting the anti-fascists. The situation now is untenable in the long run. At the time of going to press, the SWP send half a dozen paper sellers for an hour, and then go home. Would these six or so Bolshevik hardies be able to hold off a BNP/C18 attack? Of course not. Does the SWP have a van load of heavies just out of sight, ready to respond if the fascists make their move? Don't make me laugh. Brick Lane is now like just any other SWP sales pitch - a few local branch members standing on the corner hoping to flog a few copies before they get thumped. And get thumped they surely will. One day, when it suits them, the fascists will stroll down Bethnal Green Road and retake their paper sale, disposing of a few easy targets from the SWP in the process. The fruit of a strategy that relies on police protection is a good kicking. AFA opposes the reliance on state bans for precisely this reason: it doesn't work. We are not like the pillocks in the Revolutionary Communist Party and their front organisation, Workers Against Racism, who go on TV to proclaim their willingness to defend the democratic rights of the fascists. We shed no tears, not even crocodile ones, on the odd occasion when the police get stuck into the fascists. In our book, the fascists have no rights, democratic or otherwise. But “fighting" fascism with state bans means opting for the role of peaceful bystanders. It means not fighting fascism, but wishing someone else would do it for you. Worse than simply not working, it is actually counter-productive. The fascists thrive on presenting themselves as a party of action, who, in contrast to the left, can actually get things done, can actually make a difference. They laugh at most of the left as a bunch of middle class tossers who haven't got a clue. Unfortunately, the left's habit of standing behind police barriers and striking up a chorus of “The police protect the fascists" does nothing to dispel this image. On the contrary. It proves the fascists right. If we are to challenge the fascists effectively, not only on the streets (though that is crucial) but in the hearts and minds of white workers, we have to behave differently. We have to show, in action, that the fascists do not have a monopoly of violence and initiative. We have to show that we, too, can make a difference. We have to push them on the defensive, make THEM hide behind the barriers and shout "police protect the fascists - please! ", and we have to make sure everyone knows about it. Some groups, especially on the Trotskyist left, put forward the argument that it is wrong to call for state bans because any weapon that the state has in its arsenal, including any special powers you sanction for them to deal with the fascists, will ultimately be turned against you. In a sense this is true: the public order legislation that was enacted in the 1930s was allegedly to be used against Mosley and his British Union of Fascists, but in reality was used far more often against the Communist Party and other left-wing organisations. But it would be a mistake to see too much in this. The capitalist state certainly prefers to have a legal fig-leaf to shroud its real intentions against the working class and its organisations, but it hardly needs it. The rules are there to be broken, and only middle class liberals should expect otherwise. We, on the other hand, should face facts: the state is willing to use any means necessary against us, legal or otherwise. If they need extra powers to deal with the working class, they take them - and they certainly don't wait around for some well-meaning democrat to beg them to act against the fascists before they do so. The argument against calling for state bans is more practical than that. We know that the fascists are the establishment’s last resort when the going gets tough. We know, therefore, that when the state makes any partial moves against the fascists, it is to deal with a temporary source of embarrassment - a propaganda ploy. It has nothing to do with really combating fascism. Consequently, if fascism is to be stopped, it must be stopped by other means, by the direct action of the working class. State bans can play no role in this, our strategy. They are a diversion, a blind alley. Let others wander down there.